entered the field, with Gummi Bears on NBC and The Wuzzles on CBS, both broadcast weekly. Its first real hit in that area (and its first five-day-a-week cartoon) was DuckTales, which started in 1987, based on the old Carl Barks Uncle Scrooge comic books of the 1940s-60s. The series opened on September 11, 1987, with the usual 65 episodes broadcast over a 13-week period and then repeated several times. The first five — one week's worth — set the stage by having Donald Duck enlist in the Navy and leave his nephews in his Uncle Scrooge's care. There followed a long series of treasure hunts, thief-foilings, and general humorous adventuring strongly reminiscent of Barks's work. It went over so well that 35 new episodes were produced for its second season. In 1990, when all 100 episodes had been shown at least once, it was made into a theatrically-released feature film. 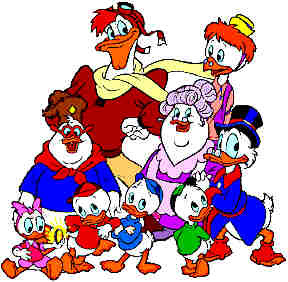 The show took most of the regular characters from the comic book's cast — Scrooge himself; nephews Huey, Dewey and Louie; wacky inventor Gyro Gearloose; Scrooge's old flame, Glittering Goldie, even Gladstone Gander; as well as the major villains, Magica deSpell, Flintheart Glomgold and the Beagle Boys. The biggest liberties taken with the cast were to write Donald out and to add an inept pilot, Launchpad McQuack. Launchpad was created for this series, but went on to act as Darkwing Duck's sidekick, as well as to appear in an occasional comic book story of his own. Other cast members created for the show's first season were Scrooge's housekeeper, Mrs. Beakly; her niece, Webbigail; and Doofus, a member of the nephews' Scout-like organization, The Junior Woodchucks. Two new characters joined the cast in the second season — Bubba Duck, a caveduck plucked from the dawn of time, along with his pet triceratops, Tootsie; and Fenton Crackshell, a hapless but earnest guy whom the writers made fun of a lot. Through an improbable series of misfortunes, Fenton became a superhero, Gizmoduck, but unfortunately, became more effectual only by unreliable luck. He later made several guest appearances on Darkwing Duck's show. A comic book version was published from 1988-91, first by Gladstone Comics and then by Disney itself, during a brief period in which they did their own comics publishing rather than license it out. Like Chip 'n Dale Rescue Rangers, Hercules (no relation), and many other latter-day Disney properties, it also appeared in Disney Adventure Digest..
Today, DuckTales can sometimes be seen in reruns on The Disney Channel, and the feature film is available, along with compilations of regular episodes, from video rental outlets. Although purists will always prefer the original comic book version, it is this series that most people think of when they hear the name of Uncle Scrooge. Text ©2000-09 Donald D. Markstein. Art © The Walt Disney Co.